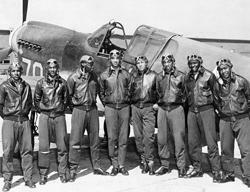 Tuskegee Airmen with trainer aircraft. 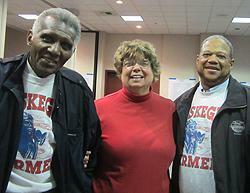 LHS President Becky Huber with Tuskegee Airmen Chapter President Tommie Huber (l.) and Billy Hebert. Each year, the Annual Meeting of the Lakewood Historical Society is held in November, the month of Veterans Day, which makes it an appropriate opportunity to honor the military in general and the many veterans and active duty service members in our region in particular. This year the Society met on Tuesday, November 13 at St. Mary's Episcopal Church, and honored the Tuskegee Airmen, an elite group of African-American pilots in the 1940s. Pioneers in equality and integration of the Armed Forces, the term "Tuskegee Airmen" refers to all who were involved in the Army Air Corps program to train African Americans to fly and maintain combat aircraft. The Tuskegee Airmen included pilots, navigators, bombardiers, maintenance and support staff, instructors, and all the personnel who kept the planes in the air. Some of the Airmen live in the Puget Sound area and we were fortunate to have two representatives of the Sam Bruce Chapter of the Tuskegee Airmen, Inc., President Tommie Lamb and member Billy Hebert, to share their stories and introduce a dvd on the history of the unit. That part of the evening's program concluded, the Society proceeded with its General Meeting, which began with the election of officers and directors. Recognition of retiring Board Member Walter Neary was followed by the election of two new Members, Sue Boguszewski and Barbara Scott. Becky Huber was re-elected President . Celebrated the 100th Anniversary of Tacoma Speedway on July 21st, 2012, at Marymount Event Center. Attended by 75 guests and 35 volunteers. Presented seven monthly programs at St Mary’s Episcopal Church with over 320 in attendance. Topics ranged from remembering the Seattle World's Fair 50 years later to the influence of the Korean Community on Lakewood's history. Unveiled our newly redesigned website and launched our new Facebook page. The Society's museum at 6211 Mt. Tacoma Dr. SW in the Lakewood Colonial Center saw nearly 1,000 visitors in last 10 months, plus two tours by the 472nd Signal Company from Joint Base Lewis-McChord and the Cub Scouts. Among the museum's exhibits were “The City of Lakewood: The Long Road to Incorporation”, with 61 in attendance. Planned for a tentative March opening is an exhibit featuring the first commercial district in the area, "Lakewood: The Community Center”. Four artists appeared in rotation in the museum's Artists' Corner: Marjorie Mankin, Ruth Hofto (who celebrated her 102nd birthday in May! ), and, currently through the end of November, JoAnn Dorsey-Hayden and Peggy Peterson. Three new volunteers at the museum this year; Billie Finley, Jim Taylor and Elizabeth Charboneau.